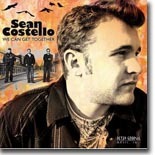 I first met Sean Costello when he was playing in Susan Tedeschi’s band at SXSW in Austin. Back then they were young and brash but very talented performers and sparks were flying. Sadly, I’ve not crossed paths with Sean since then and recent word of his passing left me wondering how I would look at his new release on Delta Groove, We Can Get Together. What Sean has done is left us some of the freshest work I’ve heard in a long time from anyone, so let’s dig into it. Distorted chords and cymbals set the tone for the title cut, “We Can Get Together,” a love song. “We can get together baby…anytime you want…I’d like to see you in diamonds…I’d like to see you in pearls…I’d like to see you in the moonlight…on the other side of the world!” Sean is definitely taken by this woman and she’s welcome at his house anytime. “Same Old Game” finds Sean with a different view of world when it comes to relationships between men and women. “I’ve got a new way of talking…wouldn’t tell you no lie…if I got something to tell you…look you dead in the eye…got a brand new rider…wouldn’t call her by name…I got a brand new angle…on the same old game!” Sean’s intensity continues on this cut and the band falls in behind the wicked groove he’s laying down. Next up is “Can’t Let Go,” a soulful number that leaves the distorted harmonics behind for a sweeter, mellower guitar groove. “I love you still…even against my will…you really know you’re a part of me…and way deep down in the heart of me…I know…I just can’t let go!” Sean’s love for this woman is strong and it’s hurt him deeply to watch her go. The hauntingly deep tones of a sousaphone provide the back drop for Sean’s lament in “Told Me a Lie”. “You say a love like ours…could never die…and you even promised me…the earth and sky…and I believed you…all the things you told me…but you told me a lie!” Time is the only thing that is going to cure the hurt that Sean is feeling now for this love he’s obviously lost. “I tried to love you…but it wouldn’t no use…feel like I’m choking…on a hang man’s noose…hard luck woman….you’re always down…hands in my pocket, girl…you’re eyes on the ground!” “Hard Luck Woman” is bringing Sean nothing but aggravation and this is one woman who’s got to go. This woman just seems to be cursed and Sean is better off to leave this one behind. Sean’s bad luck with women continues in “How the Devil.” “Give you all my money…just to buy you shoes and clothes…every time I talk to you girl….you turn up your nose…how in the devil…how in the devil I change your mind…the way you treat me…so unkind.” Sean’s guitar work is some of the edgiest I’ve heard in a long time and I appreciate how raw everything feels. Controlled anger is the term that comes to mind and he’s definitely playing angry. The tempo finally slows down and we’re treated to a softer side of Sean in “Have You No Shame.” “But I guess I knew it all the time…that your love for me…never really did amount to much…well, the weather never really be the same…you can see my teardrops for the rain…and my heart hurts…my heart hurts to the touch…have you no shame.” Deep love for this woman has hurt Sean deeply and his fretwork defines his pain for us on what is my favorite cut on the record. Sean’s soulful playing continues on the gospel flavored “Going Home.” “Soon I will be done…with the trouble of this world…I’m going home…to be with god…I believe I’m going to meet my mother over there…I’m going home…to be with God.” Its tragic how this song became a self-fulfilling prophecy. But at least Sean is in a better place. As much as I’m saddened by Sean’s passing, I’m appreciative of this last record he’s left behind for us to enjoy. We Can Get Together features some of the edgiest guitar playing I’ve heard in a long time and clearly shows that Sean was poised to break out as an artist. It’s a record that I’m sure will be in my top ten list at the end of this year on its merits. And it’s a record I know Sean was proud of. We Can Get Together will clearly be one of the best records I hear all year.